Bilayer structures composed of 5% Mg-doped LiNbO3 single-crystal films and ultrathin Al2O3 layers with thickness ranging from 2 to 6 nm have been fabricated by using ion slicing technique combined with atomic layer deposition method. The transient domain switching current measurement results reveal that the P-V hysteresis loops are symmetry in type II mode with single voltage pulse per cycle, which may be attributed to the built-in electric field formed by asymmetric electrodes and compensation of an internal imprint field. Besides, the inlaid Al2O3, as an ideal tunnel switch layer, turns on during ferroelectric switching, but closes during the post-switching or non-switching under the applied pulse voltage. The Al2O3 layer blocks the adverse effects such as by-electrode charge injection and improves the fatigue endurance properties of Mg-doped LiNbO3 ferroelectric capacitors. This study provides a possible way to improve the reliability properties of ferroelectric devices in the non-volatile memory application. The online version of this article ( https://doi.org/10.1186/s11671-019-2970-6) contains supplementary material, which is available to authorized users. Lithium niobate (LN) single-crystal films, due to their excellent physical properties, [1, 2, 3, 4, 5, 6] have been widely used in surface acoustic wave oscillators, electro-optic modulators, and data storage based on the domain switching. Recently, wafer-scale lithium niobate-on-insulator (LNOI), which has great potential application for high-density integrated circuits in electro-optic, acousto-optic, and data storage devices, is fabricated by an ion implantation and wafer bonding technology. This technology allows for a wide variety of substrates, such as LN, silicon, and even the CMOS circuit [3, 7, 8, 9]. 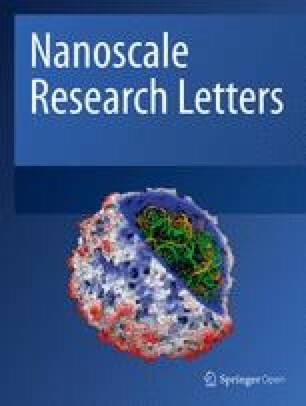 However, the imprint hysteresis loop originated from preferred orientations and the poor fatigue endurance of LN films, due to by-electrode charge injection, destabilize the retention of polarization reversal, which limits their application in non-volatile memory devices [10, 11, 12, 13]. The preferred orientations related to interfacial passive layers formed between ferroelectric layers and electrodes, which can induce a strong depolarization field in the opposite direction of polarization. It can drive out the injected charges after the removal of the applied voltage or during intermittent time of the sequent pulse stressing [11, 12]. On the other hand, because of the presence of interfacial passive layers, the fatigue endurance of LN films will be improved by blocking the charge injection from by-electrode after ferroelectric switching. However, the fatigue process accelerates if the time of the applied pulse periodicity is shorted below 0.5 s. This is described by the interfacial passive layers contribution of the accumulative space charge at certain frequencies . It is reported that an inlaid Al2O3 dielectric film can play as a tunnel switch in the dielectric/ferroelectric bilayer capacitor, for example, in Al2O3/Pb (Zr,Ti)O3, and Al2O3/Mn-doped BiFeO3 bilayer structures [14, 15, 16]. The Al2O3 tunnel switch turns on as a conductor during polarization switching, but switches off as an insulator to block the by-electrode charge injection after completed polarization switching or no switching operation . Therefore, it can prevent the unwanted injected charges and polarization backswitching, and then improve the reliability of dielectric/ferroelectric bilayer capacitor. In this paper, we fabricated 200-nm-thickness Z-cut 5% Mg-doped congruent LN single-crystal thin films and then deposited ultrathin Al2O3 layers with various thicknesses (2–6 nm) on LN to form bilayer capacitor structures. The Al2O3 films as tunnel switch layers can improve the fatigue endurance. Asymmetric electrodes (Au/Pt electrodes) are designed to form a built-in electric field against the depolarization field induced by the interfacial passive layers. The electrical results exhibit the symmetrisation of hysteresis loop transferred from the domain switching current transients with time. Meanwhile, it also proves that the inlaid Al2O3 layer plays as a tunnel switch layer, which can turn up during the ferroelectric switching and close after completed polarization switching or no switching operation. The Z-cut 5% Mg-doped congruent LiNbO3 (LN) single-crystal thin films were peeled off from their bulk crystals by using an ionic implantation and wafer bonding technology, as described elsewhere [10, 11, 17, 18]. In detail, the surface layer of a LN bulk crystal was first implanted with He ions in desired depth by controlling the implantation energy and the dose of injected ions, and then 5 nm Cr adhesion layer and 100 nm Pt bottom electrode layer are deposited by DC sputtering (K. J. Lesker PVD-75). The surface layer was bonded to another LN substrate covered with 1-μm-thick SiO2 buffer layer and sliced off. The thickness of LN film is controlled to about 200 nm by chemical mechanical polishing. Subsequently, ultrathin Al2O3 films with thicknesses (d) of 2–6 nm were deposited by ALD (TFS-200, Beneq, Finland). In detail, the precursor gases are diethyl zinc and de-ionized water. They were pulsed alternately into the reaction chamber with a pulse time of 50 ms and separated by purging steps using argon for 2 s at the reaction temperature of 200 °C . Finally, top Au square electrodes with areas of 1.0 × 10−4 cm2 were deposited through a metal shallow mask. The thicknesses of Al2O3 layers deposited on the Si wafer as contrast were measured by a spectroscopic ellipsometry system (GES-5E, SOPRA, Courbevoie, France). The film structure was analyzed by the X-ray diffraction (XRD) (Bruker D8 Advance) in a θ-2θ scanning mode with Cu Kα radiation as well as cross-sectional scanning electron microscopy (SEM, Sigma HD, Zeiss). To study the domain switching dynamics, several square pulses with a rising time of 10 ns were applied to top electrodes by using a single-channel Agilent 8114A pulse generator, where bottom electrodes were grounded. In the circuit, the domain switching current (Isw) across in-series internal resistors of all instruments with the total resistance was monitored using a LeCroy HDO6054 oscilloscope. The values of both output resistance of the pulse generator RW and the input resistance of the oscilloscope RO are 50 Ω, respectively. Figure 1a shows the XRD result of the LN thin film on a Pt/Cr/SiO2/LN substrate. The film has strong (00 l) reflections indexed in the rhombohedral phase symmetry. In addition, there are also some diffraction peaks of Pt and Cr films marked in Fig. 1a. The absence of any other peaks confirms the high crystallinity of the LN film without phase impurity. The cross-sectional SEM image of the sample shown in Fig. 1b demonstrates the clear interface structure with LN, Pt, Cr, and SiO2 stacking layers. In order to study the domain switching kinetic mechanism, two types of pulse voltage modes are designed as clearly shown in Fig. 2a and b . Type I is configured as double pulses in opposite polarities with the time interval of 5 s. The first pulse is applied to switch the upward polarization state pointing to the top electrode and the second one can switch the downward polarization. However, limited by programming time of a single-channel pulse generation, the minimum time interval is too long to catch the domain switching current transient invoked by the second pulse, due to the preferred domain orientation. To catch the domain switching current transient, a single pulse overlapping a negative baseline DC bias is proposed in type II, where the initial negative DC bias can switch the upward polarization state and the positive pulse sets the domain downward. Here, the width of the two type pulses is set to1 μs. Figure 2c and d show the domain switching current transients versus time (t) of Au/LN/Pt structure sample under various applied voltages (V) in type I and type II modes, respectively. The plateaus of domain switching current transients are observed that narrow in width but increase in height with V increasing after the initial capacitor charging current at 30 ns. The height of plateau in two modes both shows a linear relationship with the increase of V and the results are summarized in the insets by the solid-line fitting of the data [11, 13]. The coercive voltage (Vc) value in the two modes can be derived to about 24.7 V from the line interception with the voltage axis. After the termination of the switching pulse, the capacitor discharging current occurs after 1 μs, which suggests that the preferred domain orientation is the upward polarization state pointing to the top electrode. 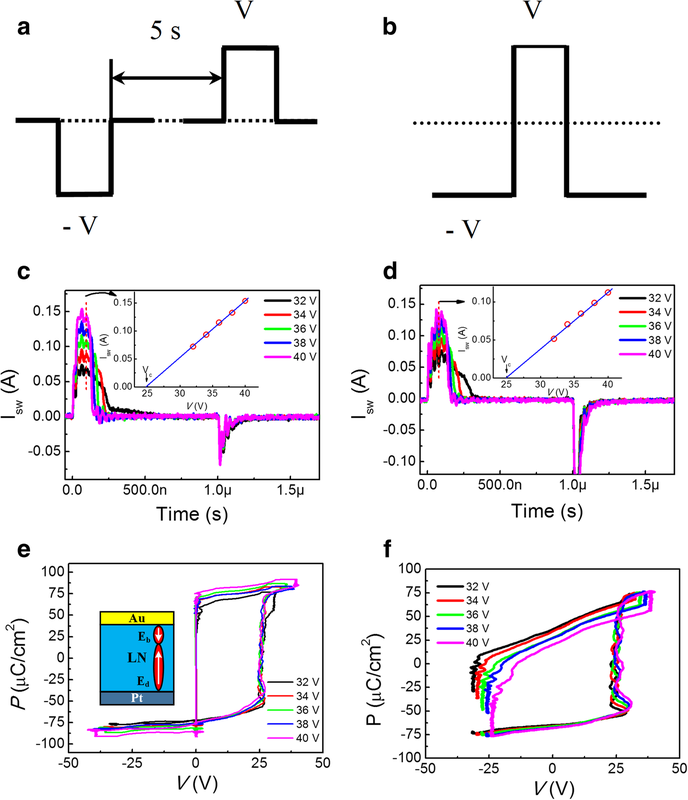 P-V hysteresis loops under different applied voltages in two type modes can be transferred directly from the corresponding domain switching current transients in Fig. 2c and d, and the results are shown in Fig. 2e and f, respectively [11, 20]. A determined forward coercive voltage of about 25 V invariable with V is obtained in the two types pulses. The coercive voltage approaches to Vc extracted from the linear Isw-V plot in the inset of Fig. 2c and d. Unlike the non-doped LN film, the Vc is variable and the value is equal to the maximum applied voltages . For the 5% Mg-doped LN, the defined Vc is invariable with V, as shown in Fig. 2e and f. This is because the Mg doping can generate Li-site metal vacancies and oxygen vacancy-related defects, [21, 22, 23] which can trap space charges and effectively shorten the resistance degradation time across the interfacial layers between the film and top/bottom electrodes . Therefore, domain switching currents overlap with capacitor charging currents in acceleration of domain switching speed with a definite Vc, as shown in Fig. 2c and d. However, limited by the pulse generator, the output baseline voltage in type II mode cannot be shift symmetrically when increasing applied pulse voltage over 32 V. Compared to the imprinted loops along the positive voltage axis in Fig. 2e, the symmetrisation of the loops are achieved along the voltage axis in Fig. 2f, different from those in Pt/LiNbO3/Pt structures where the P-V hysteresis loops in either type I or type II are imprinted toward a positive voltage . The reason of the symmetrical P-V loops in Fig. 2f may be attributed to the designed asymmetric electrodes (here Au/Pt). The work function of Au electrode is 5.1 eV, which is slightly smaller than that of Pt (5.65 eV) . There will induce a built-in electric field (Eb) with the direction pointing from the top electrode to the bottom electrode, shown in the inset of Fig. 2e. The depolarization field (Ed) induced by the interfacial passive layers has the opposite direction to Eb. The Ed can switch back the polarization in a very short time after the termination of the switching pulse in type II for the symmetrical electrodes (Pt/Pt) . In our experiment, the Eb can partially screen the Ed and accumulate injected charges in compensation of an internal imprint field,  which can slow down the backswitching time. Hence, the switched domain can maintain and backswitching current transient will be captured by type II pulse. However, the time interval of the two pulses with opposite polarities in type I mode is too long. After the first pulse, the trapped injected charges by Eb will be gradually driven out of the film by Ed before the arrival of the second pulse in type I . In order to prove the attribution of built-in electric field to the symmetrisation of the loops, Pt/LiNbO3/Pt symmetrical structure sample was prepared and the imprinted loops along the positive voltage axis were transferred directly from the corresponding domain switching current transients in Additional file 1: Figure S1a at positive pulse with voltages/widths of 30–40 V/500 ns, shown in Additional file 1: Figure S1b. During domain switching, the voltage applied on the ferroelectric layer is fixed at the coercive voltage Vfc, and the extra voltage (V-Vfc) is applied to RL. RL also included the circuit parasitic resistance (RP) and contact resistance (RC) between the film and electrodes; hence, RL = RO + RW + RP + RC. The decayed part of the switching current transients versus time can be fitted by Eq. (1). The time constant RLCi can be estimated from the slope of the fitted lines. Figure 3c shows Isw0-V plots with different Al2O3 thicknesses. RL and VC were estimated from the slopes and the X-axis intercept of the linear fitted lines. It can be seen that the VC is increased linearly with increasing the Al2O3 thickness d, as shown in Fig. 3d. Here, the Ci values were estimated as the error bounds at each V in Fig. 3e . The results show that Ci value almost kept constant (1.4 ± 0.2) nF with increasing Al2O3 layer thickness from 0 to 6 nm. In order to calculate RC, the top and bottom electrodes are shorted, which can obtain the RP (~ 2 Ω) with different applied voltages, shown as the circuit calibration by the opened symbols in Fig. 3c. Therefore, the RC corresponding to d is calculated and the result is showed in Fig. 3f. RC increases linearly from 3 ± 2.5 Ω at d = 0 to 55 ± 10 Ω at d = 6 nm. The almost d-independent large Ci values suggest that the Al2O3 layer works as a series resistor during domain switching. This means that the Al2O3 tunnel switch was switched on during FE switching. where εAl is the dielectric constant of the Al2O3 layer and ε0 is the vacuum permittivity of free space. Cf and S represent the capacitance of the ferroelectric layer and the electrode area, respectively. Figure 4b shows the linear 1/Ctot versus d plot, which suggests that the Al2O3 layer becomes a highly insulating dielectric film under nonswitching situation or post-switching. It can be derived that Cf ≈ 14 pF and εAl ≈ 7.9 from Eq. (3). Therefore, the interposed thin Al2O3 layer is proved as a dielectric capacitor. During FE nonswitching as well as after FE switching, the Al2O3 tunnel switch closes as an insulator. Figures 5 show schematic diagrams of the Al2O3/LN bilayer structure switched in type I or type II mode. Figure 5a sketches the equivalent on-off circuit of the in-series resistors and capacitors for the Al2O3 tunnel switch. In the initial state, as shown in Fig. 5b, the preferred polarization orientation is the upward polarization state pointing to the top electrode. The built-in electric field induced by the asymmetric electrodes directs from Au electrode to Pt electrode. When applying the polarization voltage, the FE switching occurs. It is understood that the voltage is applied inversely proportional to the capacitance in the circuit. In Al2O3/LN bilayer structure, during the FE switching, the LN layer has a large capacitance. Therefore, most of the external applied voltage applies on the Al2O3 layer. Ultrathin Al2O3 layer is injected by electrode charge. It switches on as a resistor when the applied voltage exceeds the Al2O3 tunneling threshold, as shown in Fig. 5c. After the completion of FE switching or for the case of a nonswitching situation, the capacitance of LN layer is very small and the applied voltage on Al2O3 decreases lower than the tunneling threshold voltage. At this moment, the Al2O3 layer plays as an insulator and switches off, as shown in Fig. 5d. Figure 6 shows the cycling number dependences of switched polarizations in Al2O3/LN bilayer structure with the thickness of Al2O3 ranging from 0 to 6 nm in type I mode. The width of pulses is 1000 ns with a periodicity of 0.5 s. It can be clearly seen that the fatigue endurance of the Al2O3/LN bilayer structure is improved gradually with increasing the Al2O3 thickness with over 104 cycles of pulse stressing. The fatigue property in type II mode is similar to the result in type I mode, which was showed in Additional file 1: Figure S2 of supporting information. Unfortunately, the electrical breakdown would occur easily in the type II mode after longtime DC voltage applied with near 104 cycles of pulse stressing. The data can be fitted using the model for the coexistence of domain-wall pinning and depinning within each cycle, as shown by the solid lines in Fig. 6, where the fatigue physics was attributed to by-electrode charge injection . When the Al2O3 layer inserted between the Au electrode and LN layer, it can block the by-electrode injection charge path and improve the fatigue endurance. However, in the bilayer structure, some issues should be further considered. For example, with increasing the thicknesses of Al2O3 from 0 to 6 nm, the coercive voltage enlarged from near 25 to 34 V, which can be reduced by improving the quality of the Al2O3 layer. Actually, a few atomic layers of Al2O3 with high quality or less defect can effectively block the charges injected by electrodes, which is confirmed elsewhere by optimizing atomic layer deposition processing conditions (such as temperature and time) . Recently, ferroelectric domain-wall memories based on the erasable conducting charged domain walls and the non-destructive electrical read-out of the polarization states have been proposed in our following research work [26, 27]. 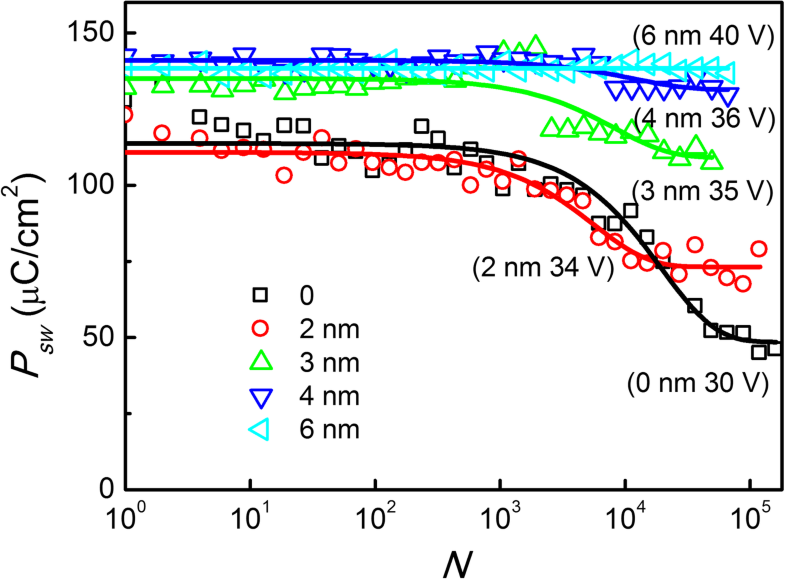 Large conductivity of charged domain walls in lithium niobate single crystals is obtained after domain switching [28, 29]. Therefore, the thinner lithium niobate single crystal thin films on silicon substrates are the promising materials for integrated ferroelectric domain-wall memories and its retention and fatigue endurance properties can be improved by design of Al2O3/lithium niobate bilayer. 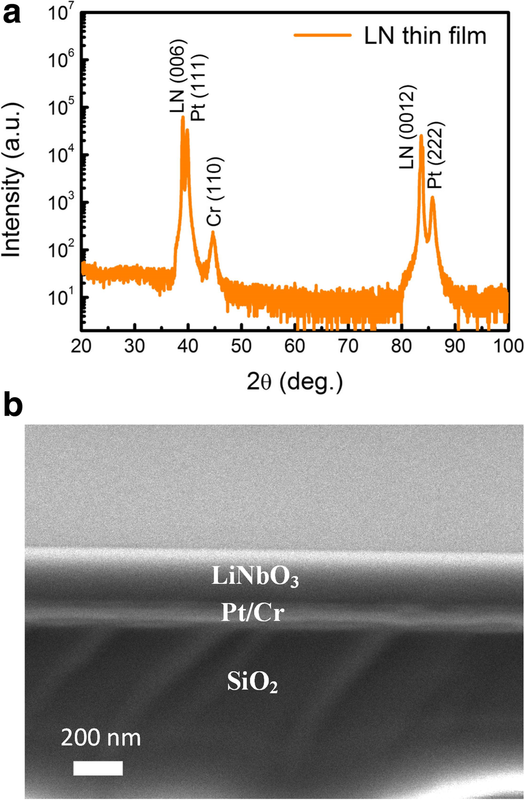 Two hundred nanometer LiNbO3 single-crystal films with 5% Mg-doping were prepared by ion slicing of surface layers from bulk LN single crystals, and then the ultrathin Al2O3 films with thicknesses ranging from 2 to 6 nm as tunnel switch layers were deposited on 5% Mg-doped LN film to form bilayer structures by atomic layer deposition. The symmetrized P-V hysteresis loops along the voltage axis are observed under applied pulse voltages in type II mode, which may be attributed to the built-in electric field induced by asymmetric electrodes in Au/LiNbO3/Pt and compensation of the internal imprint field. 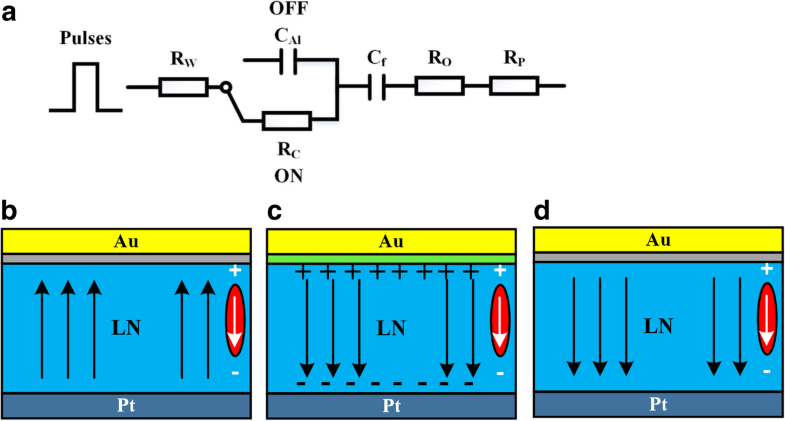 The domain switching current (Isw) transients and its transferred P-V hysteresis loops reveal that the ultrathin Al2O3 layer plays as an idea tunnel switch. It turns on during FE switching, but closes during the nonswitching or after FE switching, minimizing the adverse interference with FE switching. Furthermore, the fatigue endurance of the FE capacitor is improved gradually with increasing the tunnel switch layer thicknesses from 2 to 6 nm. 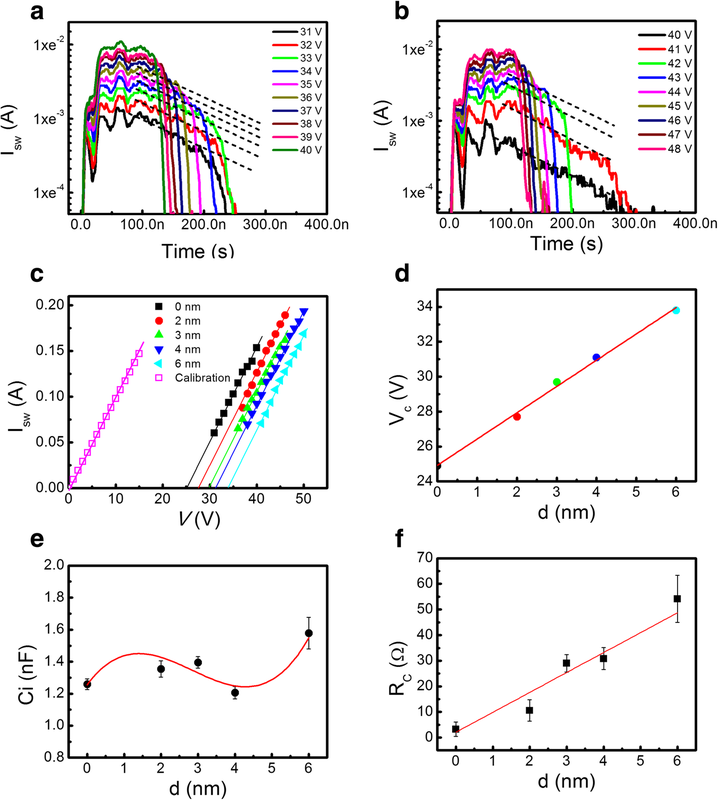 The Al2O3/LN bilayer structure paves the way to design robust ferroelectric devices in alleviating the fatigue problem by-electrode charge injection. This work was supported by the National Natural Science Foundation of China (grant number 61674044), the Basic Research Project of Shanghai Science and Technology Innovation Action (grant number 17JC1400300), the National Key Basic Research Program of China (grant number 2014CB921004), and the Program of Shanghai Subject Chief Scientist (grant number 17XD1400800). YZ and QHR prepared the materials and draft the manuscript. AQJ, YZ, and JJ designed the work. YZ, XJC, JGY, and QHR carried out the structural analyses and switching current measurements of the samples. AQJ edited the whole manuscript. All authors had read and approved the final manuscript.